Discuss the types and causes of common forms of deterioration in concrete. Explain how chemical enhancements, including crystalline technology, improve the durability of concrete structures and reduce maintenance. Analyze how crystalline technology admixtures can produce very positive performance results. Identify the role that high-performance concrete can play in achieving green and sustainable design solutions. Concrete is known for being a strong and versatile material and is used in many cast-in-place and precast structures for a variety of infrastructure and engineering applications. However, in standard formulations, it also has some known limitations when subjected to harsh conditions. Those conditions can cause physical damage or deterioration of the concrete, leading to significant problems and shortening the useful life of the concrete structure. The use of chemical admixtures in the concrete mix can help change the nature of the concrete and overcome some of those limitations, particularly deterioration. In specific admixtures, the use of crystalline technology has been shown to be quite effective in terms of waterproofing the concrete and providing resistance to chemicals, extreme temperatures and other conditions. Engineers who recognize the causes of concrete deterioration along with the best options to overcome them can create resistive concrete components that are more durable and more sustainable in the long run. All images courtesy of XYPEX Chemical Corp. 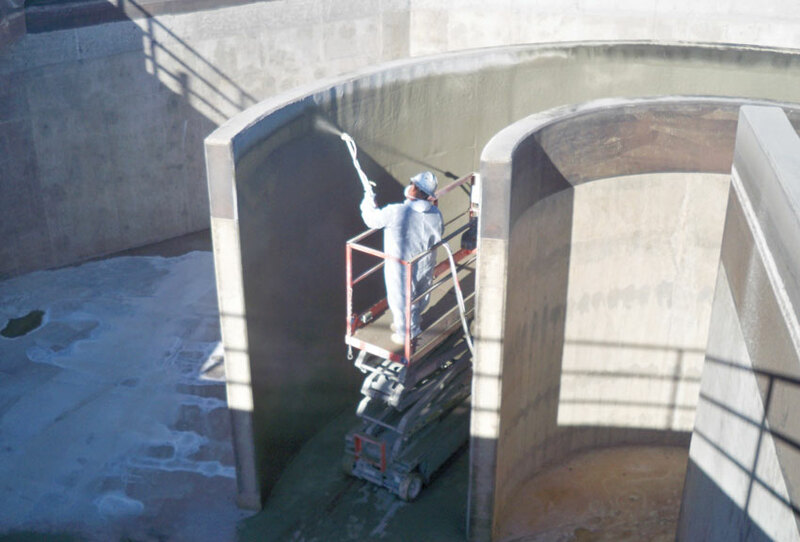 Concrete structures that are subject to water, chemicals and other stresses can be enhanced by incorporating crystalline technology into their mix or as a spray-on application. Concrete is a mixture of natural ingredients and man-made processes. The particular ingredients used and their ratio in proportion to each other can create great variety and differences in the strength, appearance and functionality of concrete. Nonetheless, there are some fundamental characteristics of all concrete that are common—some of which help define its susceptibility to deterioration. Typically, a concrete mix consists of about 60–75% aggregate (fine and coarse), 10–15% percent cement and 15–20% water. It is the water added to the dry materials that causes the chemical reaction of hydration, which allows the cement to hold all of the other materials together. Often, more water is used than is needed for hydration for the convenience of making the concrete easier to pour and form. This practice plus the mixing process can produce air pockets or bubbles that take up another 5–8% of the total mix. As the water is hydrated, drained or evaporated away, the cured concrete is left with a myriad of air gaps, holes, pores, capillary tracts and other internal voids. Further, concrete shrinks in size as it cures, although if it cured properly, that shrinkage can be kept to a minimum. Nonetheless, visible cracks or much less visible micro-cracks can occur. The end result is that while concrete may appear strong and impenetrable on the surface, it actually ends up quite porous due to the variety of openings and voids inherent within it. This porosity means that water can penetrate into and even through a concrete structure, giving it properties of permeability that are often not desirable. The limitations of concrete are exhibited in several ways. First, the surface can be physically damaged due to physical force, abuse, weather, etc. Such physical damage can cause the surface of the concrete to crack or break, exposing the inner aggregate and creating a rough surface that is vulnerable to further deterioration. Secondly, when chemical substances penetrate beneath the surface of the concrete, they can interact with the concrete and cause damage or deterioration. The extent and nature of the damage will depend on the types of chemicals or other substances that penetrate into the concrete. Finally, the permeable nature of concrete can allow water and chemicals to penetrate and cause corrosion on any metal components embedded in the concrete. This includes reinforcing steel, anchors, sleeves, post supports, angles or any other metal that is used with concrete structures. 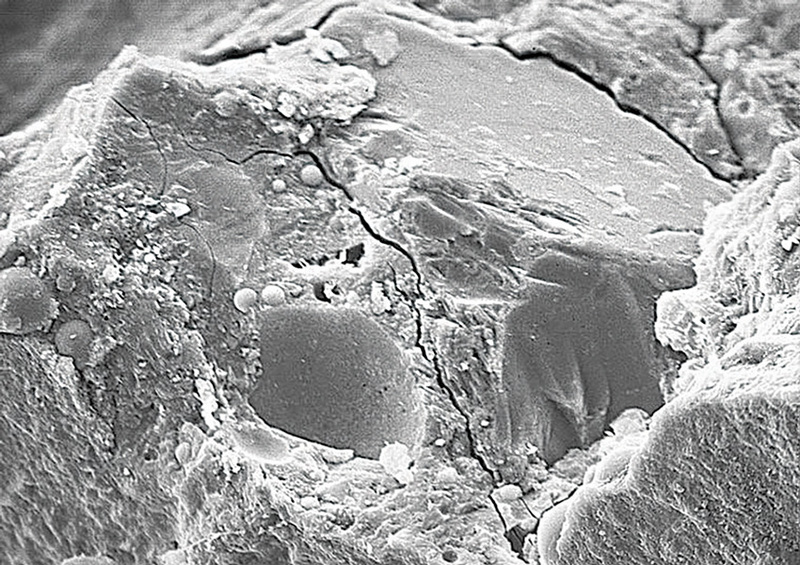 An electron microscopic magnified view of a micro-crack in concrete that can occur due to normal shrinkage. Recognizing all of these issues, the Portland Cement Association (PCA) has investigated these phenomena in some depth and identified a number of specific types and causes of deterioration in concrete. Some of them are summarized below. Abrasion damage is caused by rubbing and friction against the outer paste of concrete, exposing the fine and coarse aggregate that will cause additional degradation. The two most common and damaging forms of abrasion occur on vehicular traffic surfaces and in hydraulic structures, such as dams, spillways, tunnels and even infrastructure piping. Traffic surface abrasion can be controlled by limiting the types of vehicles and tires that are used and selecting appropriately hard aggregate to withstand the weight and wear of vehicles. Addressing abrasion damage in hydraulic structures is a bit more involved. High-quality concrete can resist water flowing over it, even at high velocities, for many years with little or no damage. However, concrete is susceptible to deterioration from the abrasive action of debris or solid materials in the water that grind or repeatedly impact on its surface. 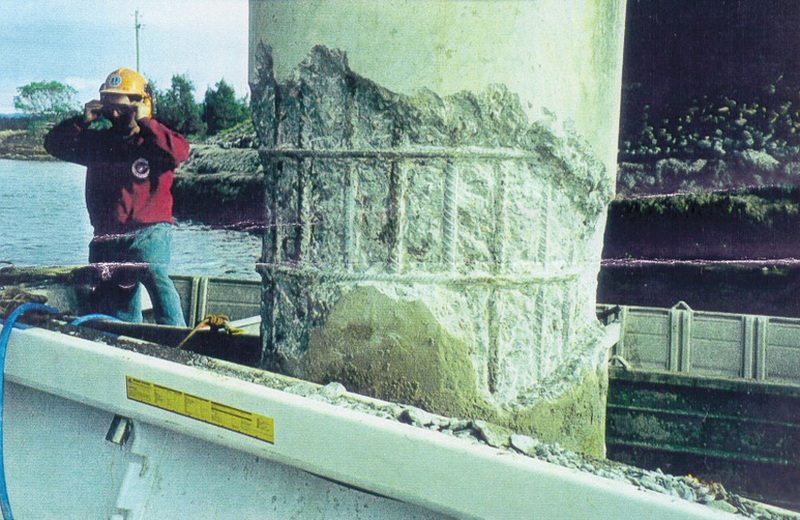 Spillway aprons, stilling basins, sluiceways, drainage conduits or culverts, and tunnel linings are particularly susceptible to this type of abrasion erosion. In hydraulic structures, it is readily recognized by a smooth, worn appearance on the surface of the concrete, suggesting that it can be reduced by using strong concrete with hard aggregates. This concrete support has deteriorated due to abrasion and erosion in a tidal zone.